52 The Daily Citizen ◆ HOW TO CHOOSE GUIDE 2015 Anyone interested in purchasing their own home knows how exciting the process can be, but also how overwhelm- ing it can sometimes feel. Locating the home of your dreams can be a time-consuming endeavor, but when it happens, most purchasers are eager to close the deal as quickly as possible. It is important, however, to remain patient as you begin to arrange for financing. The key is to take as much time as nec- essary to do things properly and select the best mortgage lender for your specific needs. Loan professionals have the potential to make the home buying process either very easy. When you work with a lender who is dedicated to providing great service, the process is likely to go smoothly. But, if your lender appears to be focused primari- ly on securing large commissions in any way they can, or pushes loan products that you're not interested in pursuing, you should exercise caution before proceed- ing. Mortgage professionals should be extremely knowledgeable about a wide variety of loan products and should be willing to spend as much time as neces- sary to explain them. Solid lenders are eager to answer buy- ers' questions and take pride in guiding them through what can be a confusing process. The best mortgage professionals keep the borrower's best interests and financial priorities in mind when helping them finance their home purchase. Doing some advance research on loan options is a great way for home pur- chasers to measure whether or not they are dealing with an honest mortgage pro- fessional. Knowing a bit about loan products before you sit down with a lender can help you determine whether he or she is truly concerned about your needs. Having at least some knowledge about the financing process will allow you to make a sound assessment of the mortgage professional's motivation and decide whether he or she is a good fit. Purchaser's rights Dealing with mounds of forms, decla- rations, and financial terminology can be dizzying to the inexperienced home buyer. However intimidating the process may feel, great care must be exercised in mak- ing sure you understand everything you are signing and the obligations you are assuming. A signature cannot be erased, and buy- ers may only have a short time — or no time at all — in which they can rescind their offer. Even if done within the permissible period, a purchaser will still likely forfeit any deposit paid if they do not follow through with the deal, and they may also owe an additional amount based on the amount of the initial mortgage payment. This is an expensive proposition that can be avoided simply by exercising sufficient care when signing all agreements. If a mortgage lender is rushing through the paperwork and pressuring you to quickly execute the forms, they really are not doing their job properly. Under such circumstances, the pur- chaser's best interests are being neglected, and the likelihood of misunderstandings grows significantly. Communicate with your lender Experienced mortgage lenders take the time to gain a thorough understanding of a purchaser's long-range financial goals. A good lender will want to know how long the buyer intends to remain in their new home. This type of knowledge helps them suggest the mortgage products that best suit the borrower's needs. If a lender fails to ask this kind of question, the pur- chaser should consider it to be a serious a red flag. Seek local lenders Finding a mortgage lender in your geo- graphical area is usually best. Because interest rates can change on a daily basis, a local lender is better able to remain attuned to rapid changes in the local housing market, and will always know how such changes may affect his or her clients. A local lender also allows for closer monitoring of your loan application as they will be more readily accessible to answer any questions a potential home buyer may have along the way. 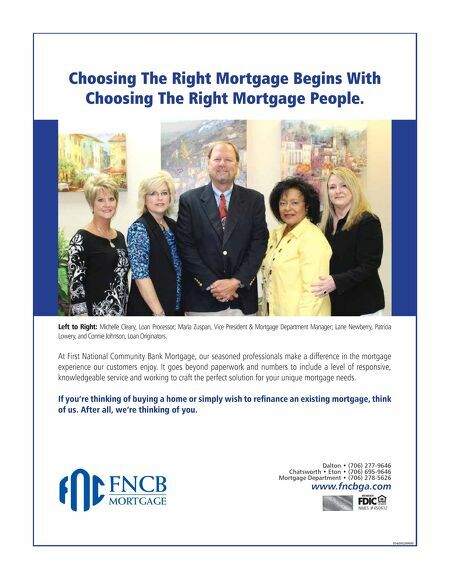 Take advantage of personal referrals Feel free to ask family members and friends about their experiences with mort- gage lenders, and if they are comfortable recommending the professionals they used for their home loans. Word-of-mouth recommendations offer a great way to identify the very best pro- fessionals in your area. Once you receive a few possible names, take the time to verify their profes- sional backgrounds so that you will feel confident in their ability to provide the sort of quality customer service you desire. 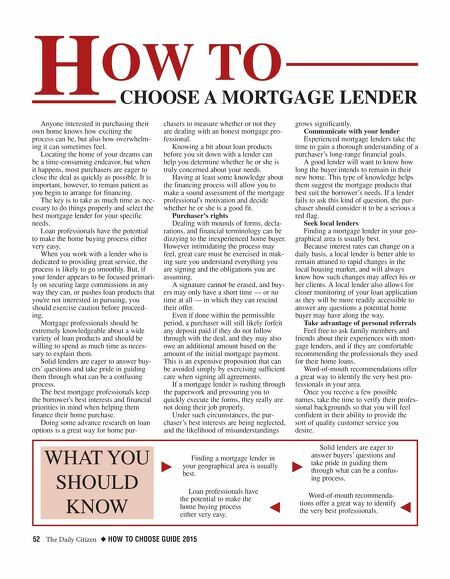 H OW TO CHOOSE A MORTGAGE LENDER WHAT YOU SHOULD KNOW k j Finding a mortgage lender in your geographical area is usually best. Loan professionals have the potential to make the home buying process either very easy. k j Solid lenders are eager to answer buyers' questions and take pride in guiding them through what can be a confus- ing process. Word-of-mouth recommenda- tions offer a great way to identify the very best professionals.